Fleetwood striker David Ball is playing through the pain barrier to make sure Town retain their League One status. They are still one point from survival with one game to play at home to Crewe on Sunday, having failed to finish the job when they lost 3-1 at Walsall on Monday. 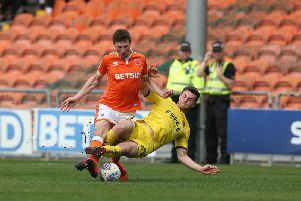 And Ball, who received seven stitches in a calf wound sustained during the 0-0 draw with Blackpool 12 days ago, is determined to do all he can to ensure Town beat the drop. He said: “I’m all right. I played with the stitches at Walsall and actually played on at Blackpool. “I’ve gone for a challenge in the air and (the Blackpool player) has gouged into the side of my calf. “It was opened quite badly but I’ve had the stitches and I’m getting on with it. “I didn’t want it opening up again, so I had it patched up before the Walsall game. “It is part and parcel of the game. At Walsall, Ball was in the starting 11 for the first time since the 1-1 draw at Swindon at the start of April. And he hopes he did enough at the Banks’s Stadium to retain his place this weekend. But there is a lot of competition for places up top,even though on-loan Bristol City hotshot Wes Burns is doubtful with a hamstring injury. In Burns’ absence, Ball was partnered by young Nick Haughton, the 21-year-old making his first appearance since a three-minute cameo in the 1-0 home defeat by Walsall in March. Devante Cole came off the bench to score Town’s goal on Monday. Shola Ameobi was also was fit enough to be named on the bench. And with the pacy Ash Hunter and top scorer Bobby Grant also among the bank holiday substitutes, manager Steven Pressley has a lot of attacking options. Ball would love to start but says it does not matter who gets the nod as everyone is fighting towards the same goal of survival. He said: “I was pleased (to play). I thought I worked hard up there. “But in the first half we did not get up as a team and there was a lot of space between players. “I’d not played for four or five games, so it was nice to get a full 90 minutes. “Now hopefully I’ve done enough to keep my place. It is good competition. Despite the setback against the promotion-chasing Saddlers, Town are still two points clear of fourth-bottom Blackpool. And with Town’s superior goal difference effectively counting as an extra point at this stage, Ball is confident they will survive. He said: “It is still in our own hands. “But we have had too many chances when it has been in our own hands and not come through with it. “I’m very confident we can do it. “We did not give a good account of ourselves at Walsall, but we all know what is at stake on Sunday and it can change your career path. “Everyone needs to know in the dressing room that we have to give it 110 per cent to keep Fleetwood Town in this league. “We are a strong group of players. “It was more a sense of disappointment (after the Walsall game) among the players that we hadn’t given a good account of ourselves. “We especially wanted to do that because it was the second-to-last game of the season, it was against one of the good sides in the division, and the game was shown live on Sky TV. “We are disappointed that we have not shown everyone watching what a good side we are.